Welcome to Sleepy Creek Cabin...... Maximum Occupancy (4) people total. Pet Owners: Please review Pet Policy/Restrictions prior to booking (rate section notes). Please send inquiry for any questions. Thank you. If you are looking for a unique and rustic cabin to relax and recharge in a beautiful mountain setting, you've found it! Private, yet convenient to all the High Country has to offer. Come and experience the charm of a 'real' pioneer log cabin. Enjoy the simple pleasure of nature's beauty and early Americana bundled into one. Take a deep breath, now...exhale! Sleepy Creek is made from the logs of two authentic 1800's log cabins (from Kentucky and West Virginia) that were re-assembled and joined to make a very unique and comfortable vacation get away. This cabin is constructed of beautiful antique hand hewn poplar and oak logs, wonderful stonework, complete with a cedar shake roof. 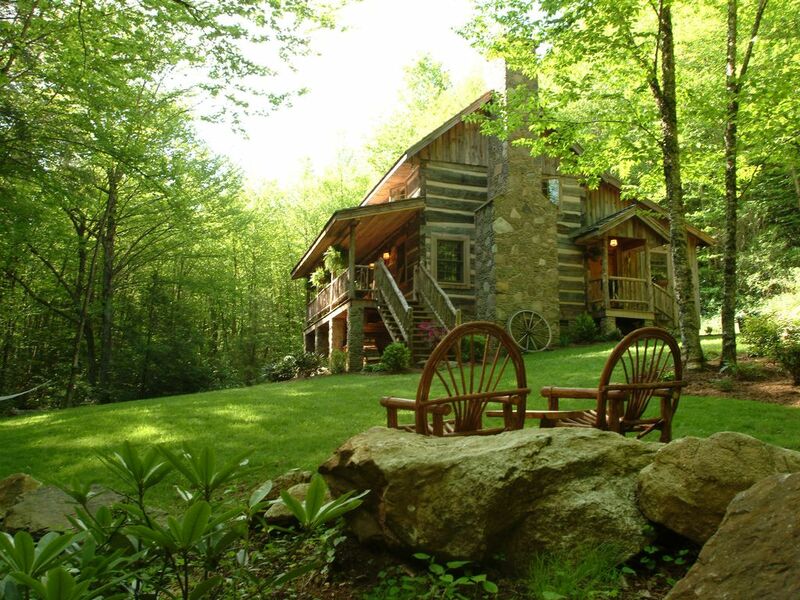 It is located on over 4 acres of wooded land with a beautiful stream running past the cabin through the entire acreage. The interior features large rooms with (2) bedrooms and (2) bathrooms. The master is located on main floor (queen) and has a small private bathroom. Black walnut plank flooring, antique knotty pine paneling and soap stone block fireplace blend with newer components to set the stage for this cozy retreat. The second bedroom encompasses the entire upstairs (one double and two single beds) with vaulted ceiling and ceiling fans. The rustic farm house style kitchen is fully equipped, features all new appliances, but maintains it's country charm with period pieces, including an authentic turn of the century Hoosier Cabinet. There is also a separate laundry room. A 2nd bathroom is located downstairs. But the best part is the covered front porch. Relax to the view of the very noisy creek and the many hummingbirds that frequent the cabin in the summer. Don't forget to enjoy a picnic or nap by the creek - benches,picnic table and hammock provided. Sleepy Creek provides the perfect setting for your relaxation, comfort and enjoyment. I'M SORRY, WE DO NOT OFFER CABIN FOR WEDDINGS, SPECIAL EVENTS, OR MONTHLY RENTALS. PLEASE NOTE PET POLICY/RESTRICTIONS. INQUIRE WITH QUESTIONS. Sleepy Creek can accommodate a max. party of (4) people or less and is conveniently located to Boone, Blowing Rock, Todd/New River, W. Jefferson and access to the Blue Ridge Parkway is just over our ridge. Choosing the perfect vacation home is so incredibly difficult and personal. We knew we wanted to restore an antique log cabin, with all the trimmings that come along with the simple, unique craftsmanship of our early pioneer heritage. Twenty years of dreaming, off and on again searching, found us in what we believe is an incredibly beautiful section of the N.C. Mountains. Located in a quiet valley setting, with a cold noisy mountain stream to lull us to sleep, yet within convenient proximity to nearby towns, and Parkway access just a hop, skip and jump away - we were home! A few years, and a lot of hard work later, Sleepy Creek was created, and has become a very special place for us to unwind, enjoy simple pleasures, and make special memories with family and friends. We hope you will visit and enjoy the cabin and area as much as our family. Master Bedroom only (window unit). Due to valley setting/wooded area, A/C is usually not needed. For sleeping comfort we have window unit installed in Master bedroom for summer months. Supplies furnished: Dishwasher detergent, liquid detergent, trash bags, coffee filters, liquid hand soap, starter roll of paper towels. 32" Smart TV in LR, small TV upstairs for dvd use only. Maximum Occupancy: (4) people total due to septic capacity/health codes. Pets: Dog(s) Only. (1) adult (over 1 yr.) dog under 40lb. Non-refundable pet fee applies. Must be completely house-trained/flea free, not permitted on furniture/bedding, and not left alone in cabin unless crated. on rare occasions we may consider (2) smaller dogs but each would be subject to a pet fee. Once you catch your breath, go have some fun! Boone is just a short drive away. Visit the wonderful downtown shops, catch one of the many concerts, plays or cultural events at Appalachian University. Make time to explore Blowing Rock , great shopping and really good 'eating' places. The kids would enjoy a trip to Tweetsie Railroad, local gem mines and Grandfather Mountain's Swinging Bridge and Natural Habitat Zoo. In the opposite direction towards W. Jefferson, grab your golf bag and head to Mountain Aire Golf Club and enjoy a 18 hole public course in a beautiful mountain setting. Make sure you visit Historic Todd, there you can rent inner-tubes, canoes and kayaks to float down the New River or sit back and enjoy music and story telling events held in the park during the summer. So, come and enjoy... go as fast or as slow as you want. There is always so much to experience close by in our lovely NC mountains.